Tobacco Road Golf Club - The Most Fun Course in America? I couldn’t tell you why, but of all the courses on the Top 100 Public list, there’s one my readers and friends have told me about more than any other: Tobacco Road. So all that was left to do now was get to North Carolina! Luckily a few weeks ago the opportunity to head to the Think Tank 2014 conference in Charlotte came up. It was easy to tack on to my NYC trip, but then, naturally, I had to look up all of the courses near Charlotte. A quick search helped remind me that there are SIX Top 100 Public Courses near Pinehurst, which was about a two and a half hour drive. Well, I can’t not go right? It would be a stretch to fit all of them in to my schedule, but I was going to do everything I could to make it work. I setup a tee time for 2:30 the day my conference ended, so after rushing to pack after the closing keynote, hopping an Uber to the airport to get a rental car, I was off in my hamster car – a sweet Kia Soul. Ha. I was going to be cutting it close, so I was keeping my fingers crossed for no wrong turns. I made the trip without incident, and pulled into Tobacco Road about 10 minutes before my tee time. When you pull in, you wind in and out of pine trees, and the simple clubhouse is up on your right. After changing and grabbing my clubs, I headed up to where they told me I should tee off on 10 to avoid some long delays of foursomes in front of me – and to ensure that I got done before it got dark. Tobacco road opened in 1998 and was designed by the late Mike Strantz. I’’ve never played any of his other courses, but you can bet I’m going to go track them down now. They guy obviously loved elevation, crazy angles, and unique, fun golf holes that are unlike anything I’ve experienced anywhere else. Even though I played the back first, I’m going to write about them in order. However, I will say from the moment I hit my first tee shot down ten, I could tell I’d be in for a special experience. Fees: $49-134 depending on time of year. I played from the “Disc” tees which measured in at 6,304 yards. The course isn’t long by any means, with the ripper tees (tips) barely topping 6500 yards. I was pretty rushed getting up to the tee, but could not have been more excited to play the course. Because I was a single, and daylight would be in short supply, we decided teeing off on 10 would be the best bet in order to avoid as much traffic as possible. The 10th hole is a sweeping, downhill dogleg right – and a nice sampling of what was to come for the rest of the round. One unique feature of Tobacco Road is that all of the bunkers are played as waste areas – so grounding of your club is permitted. After a perfect drive, my approach came up slightly short and I quickly learned that if you don’t hit your spots on this course – there’s a good chance you’ll be finding the sand. A beast of a par 5 that has everything I love in a golf course. It has risk/reward, pronounced features, and plenty of scenic value. If you hit a solid drive you’ll be tempted to go for this one in two. The green is tucked way back above what has to be the deepest bunker I’ve ever seen – even more so than #11 at Whistling Straits. If you’re in the middle of if, it wouldn’t be too big of a deal, but if you hit the lip and find yourself at the base of the wall, you’re screwed. I had a poor second shot, and was left with an 8 iron in, but I went with a 7 because I sure as hell didn’t want to find myself in that beast. A dogleg left with a big landing area. The real magic on this hole is on the approach. There’s a bunker all down the left and a giant ridge between it and the green. It makes for a partially blind approach, so you have to take a close look at the pin location and trust your yardage. This is not only one of my favorite holes on the course, it’s one of my favorites in the world. What I love about Tobacco Road is that around every corner is a surprise. A unique hole, shot, piece of scenery. Tobacco Road is basically the Mecca of “fun golf” – and the 13th is the perfect example of this. 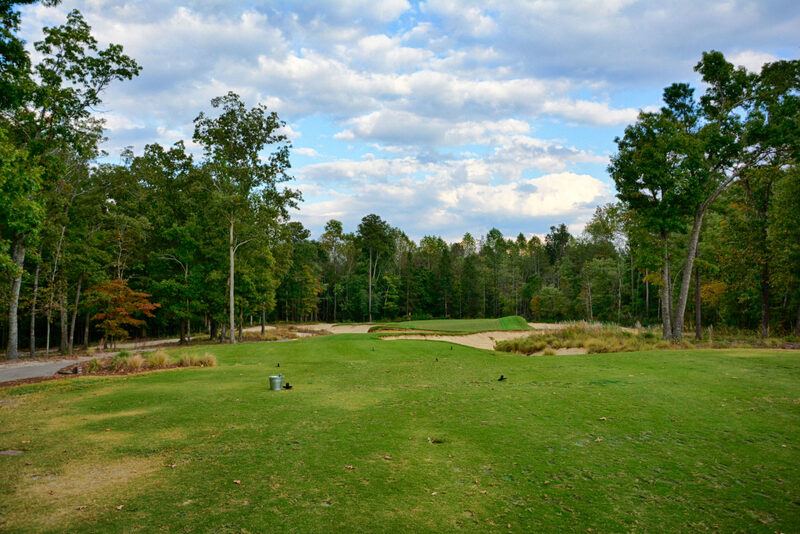 A true par 5 that has you on an elevated tee hitting down to a sweeping dogleg right. Choose your club and line wisely, because it’s totally possible to drive through the fairway if you’re not careful. The second shot is relatively benign, basically just putting it in play over a narrow gap to set yourself up for the approach. The approach on 13 is one of the finest anywhere. There’s a very, very tight opening to an elevated and narrow green that’s tucked in a canyon. It’s absolutely gorgeous, and difficult at the same time. How do you follow up a hole like 13? With a beautiful par 3 over a lake. This is one of the tougher greens on the course, as it’s pretty sectioned off, and if the pin is in the back part of the green you’ve got a much tougher shot ahead of you. This was probably my favorite par 3 on the course. One of the unique aspects of Tobacco Road is just how many blind shots there are. You rarely see such a modern course incorporate so many blind shots – both due to pace of play and safety (this became an issue on 18) – but that’s part of what makes it so much fun. That’s part of the fun though! A short, and severe dogleg left. All you need is a hybrid to knock it 210 out into the fairway, before you’re met with a steep uphill approach to a deep green with a giant hump through the middle. My tee shot was positioned perfectly, but I left my approach just a little too short and watched the ball roll all the way back down to the bottom of the fairway. I got the next one up to about 15 feet and rolled it in for par. The guys up above me on the 18th tee yelled out “nice birdie” and I had to fess up to the fact I missed the first approach. A short downhill par 3 that has one of the widest greens I’ve ever seen. Seriously it must have been 100 yards from one side to the next, forming a giant U shape. Depending on where the pin is, makes this a very different hole. Another incredibly fun and unique hole. We got held up here on the tee for a long time, which was a little frustrating – but I cruised through the rest of the 9 so I cant complain too much. The tee shot has you hitting over a giant waste area to the fairway about 175 yards out. It’s a blind shot, so you have to wait for the people in front of you to ring the bell. Apparently the group behind me didnt get that message. As I was standing in the middle of the fairway I hear a “tiiiing!”. It’s a good thing I heard it, because after running behind my cart, a ball came flying down, hitting the exact same spot where I’d been previously standing. The people behind me didn’t seem to care too much that they almost killed me, when I confronted them at the end of the hole. Even though this is where I was making the turn, I can only imagine what it would feel like coming up to this as the first tee. You’re staring down a canyon with outcroppings cutting into the fairway about 200 yards out – making you question your club selection. I haven’t played Pine Valley (yet), but based on what I know I can see where this got the reputation of being “Pine Valley on Steroids”. The green is guarded by 3 deep bunkers, and after a pretty terrible second shot I threw up a 4iron and just hoped I’d get it close. Luckily it landed smack on the left hand side of the green. #2 is a mid-length par 4 with a giant hump of sand right in the middle of the hole. The play is to stay as far left as possible, as that will give you the best angle at the green. I was too far right and didn’t have a clear shot. There’s bunkering all down the left of the green, and if you miss and are lucky enough to miss the sand, you can expect some steep rolloff as well. These first two holes do an excellent job of setting up s0me of the features you can expect to see on the course. The first par 3 on the course and one of the wilder greens. The front right has a giant ridge to contend with and any pin close to that is sure to be a challenge. There’s bunkering pretty much everywhere, so if you don’t hit the green you best be ready to pull out your sand wedge. The par 5 4th should not have been that difficult of a hole, but man did it give me problems. This is another excellent risk reward hole, as a good drive will leave you in a position that just begs you to go for it in two. I sliced the hell out of it and ended up in the woods, but even after my drop I was tempted to go for it. Lost that one in the woods left of the sand. Somehow got up and down from there to save a bogey, but this is definitely one of the better birdie opportunities on the course if you play it smart. You know…and don’t lose two balls. Speaking of risk/reward, we’ve got another one! This is one of the more fun and rewarding short par 4s I’ve seen. The fairway is off to the right and is the sensible play. But if you can knock it 250-270 off the tee, you can clear the entire waste area and get up near the green. There’s actually more room in front of the green than you think in a collection area, so going for it isn’t quite as stupid as it first seemed. I missed clearing the sand by a few feet, but was still able to pitch it up and two putt for a par. The second of three short holes on the front is also one of the more scenic. You’ve got waste bunkers everywhere, but when it comes down to it, you’re really faced with a narrow green with bunkers just waiting to swallow up anything short or long. I would find both of them before settling with a double bogey. This is another hole, that if you haven’t played it before can be a little confusing. You can’t see the green from the fairway, so it’s tough to figure out where to put the ball. Basically if you bomb it straight down the fairway you should get some roll and be in a good position to have a mid to short iron in. This is a large and undulating green with a giant bunker guarding the front right. Another solid par 3 that is one of the longer ones on the course. It’s downhill and a ton of fun if the pin position is in the front as you have a pretty huge backstop due to the green slope. So if you go a little too far there’s a good chance you’ll get some roll back down towards the pin. Watch out for the two bunkers on either side of the green, especially if you’re hit with an upper right pin. Don’t try and be a hero. Another spectacular hole that’s one of my favorites on the course. Like many of the holes here, it’s all about the approach. Pictures can’t do justice just how elevated the green is on #9. Pretty much regardless of how well struck your drive is, you’ll have a tricky second shot. But enjoy it, as you won’t see many like it anywhere else! In the end, I LOVED Tobacco Road. It’s fun, unique, and I wish they’d build more courses like this one. While I do think it should be ranked higher than it is, I can also understand why it might not be in the truly upper echelon of courses in the US. While it’s a ton of fun, and there are tons of different angles to play – I didn’t necessarily think it was the most strategic course I’ve ever played. Don’t get me wrong, there are some excellent holes where I had to really think about whether or not I was going to go for it (namely #4 and 5). But often, I pretty much knew exactly what shot I had to hit on any given hole. 13, I knew exactly where I had to put the ball each time – I didn’t really have many other options. And to let you know just how I feel about it, if I were planning a trip for my golfing friends from Portland who don’t travel much to golf, Tobacco Road along with Arcadia Bluffs would be the two courses I’d realistically want to take them to most. Have you played Tobacco Road? What did you think?? Arccos Golf vs Game Golf - Which is Better? Sean I was one of the many people who suggested you play Tobacco Road. I live in Raleigh so I am close by and it is the most fun course I have ever played. Glad it lived up to the hype for you! If you only had the choice of this or Pinehurst (and never playing Pinehurst before) would you pick this one? That really comes down to how much you care about the history of the course, and the style of courses you like to play. Pinehurst #2 is one of the most famous and historic courses in the country, so just being on the course is a bucket list experience. If you’re going based off sheer “which course will I have more fun at?” – then for me the answer is Tobacco Road. Pinehurst is a better course from an architectural and history stand point. Tobacco Road is the equivalent of modern thrill ride – and is one of the most fun courses I’ve ever played. Great write-up and pictures. It’s a spectacular place visually. Agree with you on the strategy. If you can place shots, it is much easier than it looks. Very fun track though in my opinion. I have played it about 5-7 times. Played there myself for 1st time on Nov. 5th this year. Heard LOTS about it also. Either you love it or hate it, I LOVED it. Reminded me a bit of the better Long Island courses,sand areas,scrub areas, up,down, blind, its got it ALL and GREAT greens also. Had 4 birds on way to a 74 & missed another 3-4 from close range. Looks more intimidating than it is, but you have to bring your A+ game. I had it that particular day. The Coore/Crenshaw course in the area Dormie Club has a few similar characteristics, but not the WOW value TOBACCO Road has. I retired to Ocean Isle Beach , N.C. about five years ago so I have access to the many golf courses from Myrtle Beach ,S.C. to Wilmington N.C. I play about 3-4 times /week all over the area. The course where I had the most fun …..hands down….was Tobacco Road !! When I walked up to the first tee I literally started laughing…..asking the starter where in the heck is the hole?? When he said” aim right through the middle of those two hills” I looked at my group ( 24 of us standing near the first tee ) and we all started laughing. Someone said ” Strantz has no sense of humor……….or did he? Hole after hole a different challenge…..A course with such challenge . natural beauty. and terrific fun. Did I mention you that you should take a few more golf balls with you for this one? I played this course once, put me in the hate category of his designs, this course along with his design of Royal New Kent in VA are awful (RNK is one of the worst maintained courses I’ve ever played, although they did have decent draft beer). I wouldn’t play another one of his courses unless they let me play the first round free. And i even shot a 71 at Tobacco Road. Had 5 birdies, which shows you how bad i played the other holes. Thanks for the thoughts – as mentioned, its definitely a polarizing course! Thanks to this review I just played Tobacco Road and can say that I was not disappointed. I loved the drama and unique layout. My only comment would be that the fairways were just coming out of dormancy and weren’t in the best shape but the greens rolled fast and true and overall it was a great experience. Your review helped me choose this course over the numerous other top 100 public courses in the area, let me try to repay the favor. Go to Streamsong as soon as you can. Beautiful, fun, and challenging and based on your other reviews the style is right up your alley. Oh, and I broke 80 for the first time too! TR is in my home town. always a blast. It may offend golf purists but it always brings a smile to my face. I have directed golfers from London to Beijing to try it. I’m from PA and playing both Tobacco Road and Dormie Club next week on a trip with the guys. Looking forward to both. I doubt I could break 80 on either, but I’d take an 85 for both! Any advice? I understand why so many people either love or hate this course… Put me in the love camp. Visually this course is so stimulating! My opinion is that if you can consistently hit your irons to your number you will do well here and have a lot of fun. If not, you are probably in for a long day. I bought a yardage book (and why wouldn’t you? They are only $5, or $1 if you agree to join their mailing list). It is target golf, no question. But being from Birmingham, AL and frequently playing the RTJ Trail, this was nothing new to me. I like that you have to hit some irons off tee boxes on par 4s instead of blindly pulling a driver every time. With the recent greens conversion to mini verde, they were a bit firm, but not egregiously. They were, however, very grainy, which didn’t bother me. You just had to be a bit firmer than you normally would be to keep putts from drifting out of the hole. I agree that the approach and green on No. 13 is among my favorites I have ever played. Nice review of my favorite golf course in the Pinehurst area. The pics you included were stunning. If you ever get the chance to go back to this area you should really make a point to travel about 1 hour west of Pinehurst to another Mike Stranz golf course Tot Hill Farms located in Asheboro, NC. This is another Strantz course design you wll either love or hate. Plenty of strategy, blind shots and every hole will leave you breathless at the beauty that surrounds the entire mountain golf course. The 1st hole here is scenic, dramatic, and stunning. And if you really like Mike Stranz, then you need to make it down to Myrtle Beach, SC some time and play both Caledonia and True Blue. I can’t say enough about these courses. From what I understand Stranz cut loose from Pete Dye and cut his teeth in the golf business designing/constructing Caledonia which is widely acknowledged as the best couse in Myrtle Beach. While he worked with Pete Dye he help design the Pine Barrens golf course located north of Tampa, Fl and this course seems very similar in design to both True Blue and Tobacco Road. life sometimes is not fair as this genius was taken from his fans far too early. Just a couple of things to your post…. Mike didn’t work with Pete Dye, but rather Tom Fazio. Mike was Tom’s lead shaper on many projects. Many of Tom’s courses have pieces of Mikes influence. The Florida facility you’re referring to is Black Diamond Ranch, another Fazio in which Mike had a very solid hand in doing. There are many more, however, I’ll leave it alone. Mike grew weary of all the traveling while working with Fazio and with a young family at home he decided to leave the business and stay closer to home. While working on the grounds crew at Wild Dunes, a hurricane washed away the 17th and 18th holes and he was asked to redo them. Mike agreed and went on to completing the work and getting the “bug” all over again. He starting up his own company and started designing courses that were close enough to SC to make sure he could reach his family at the end of the work week. First starting out with Royal New Kent in Virginia followed by Stonehouse, Caladonia, True Blue and then Tobacco Road, Tot Hill Farm, Silver Creek and finally Montery Club (Shore Course). The last two being redesigns. Great review. Loved seeing your Top 5 choices. 4 of us are stopping here after the Monday Practice round at Augusta for a 3 day package. I’ve played THE Road twice before (2015 from the Rippers, 2016 from the Discs) & had a blast both times. I have raved about this course, so it was a must play for my guys. We decided on Dormie as well, so glad to have read that review as well. Strantz courses can be polarizing. They are visually intimidating off the tee, similar to the Dye courses I’ve played. However, if you think your way around you’ll be fine. Try to over power them & it could be a long day. Just got back today in which I played TR from the ripper tees. The Pro informed me that the greens, which now have Bermuda Champions grass, would not be very receptive to approach shots even though the grass was very damp from the heavy rains the day before. He was correct about this. On many of the holes my ball would hit the green and just keep going to the back of the green. Apparently this type of grass forms a very thick root mass below the surface. As a result, the green are very hard and most of the time you will not be able to locate your ball mark as the greens will not yield a mark. Additionally, the greens were exteremly fast. I would probably guess the stemp around 12-13 range. With greens like this you need to play a lot of shots that bump and run. As you are aware, there are not many holes at TR that lend themselves to playing a bump and run. Anyway, expect scores much higher than your use to under the current conditions. I have now played TR about 12 times now and I am learning more about this course everytime I play it. I finally parred hole 9 from the ripper box which plays around 400 yards for a par 4. With the 30+ foot elevation change on the approach shot this hole plays at least 430 yards. Another accompliment for me was I was able to get on in 2 on the difficult uphill par 5 twelfth hole. Two putted for the birdie. Another surprise hole for me I was able to hit the 18th green from 210 yards out with hybrid but the ball ran off the back of the green. The pin was in back but the severe downhill chip back from a steep hill, with no green to work with, had no chance of stopping and sailed 20 ft past the hole. Finished with a bogie on this very difficult hole. Anyway, the greens are looking beautiful. Come spring they’ll soften up and this will make this course a little more playable than it was today. I still really love playing this course. If you have a good game and you have a yardage book you can score well here. This course is so much fun to play. Every hole here is so memorable which makes this course so special to play. If you have a double digit handicap, you will struggle playing this course. I am doing the same thing!! Where else are you playing? We’re staying in the 7 Lakes area and are not familiar with what courses are around, don’t want to break the bank playing #2. Any recommendations would be greatly appreciated. Really looking forward to playing TR, has been on my bucket list since I first heard about it a few years ago. Cheers! Great review, Absolutely love tobacco road. Lived close to tobacco road and stumbled across it 4 years back, fell in love with it. One of the most fun,risk/rewarding courses i have ever played. the 2 par fives on the back nine 11 & 13 are some of the favourite holes i have ever played. the risk reward on 11 over that gorge of a bunker is great. Love 13, if you hit a long ball you can actually aim right and hit it over the top of the trees and land on the 2nd part of the fairway and leave a short iron into the green. Another great mike strand course in the area is tot hill farm, amazing elevation changes and down right fun. Great website and great reviews. Great review and even better pictures. Tobacco Road is truly a “thrill ride”! Two years ago I stayed at Pinehurst and played #6, #2 and then #4 twice. #2 was great and #4 was even better. However, I always ask the locals what are some of the best courses in the area… they all suggested and praised Tobacco Road. Do to time restraints, I never made it up to Sanford from Pinehurst on that trip. Then a year later I was in Greensboro to play Sedgefield CC (Home of the Wyndam PGA Tournament) for a round with a member. Once again I make a point to ask the locals what other courses should I play in the area and the answer was the same… Tobacco Road! Ok now I have everyone on the north side of the state telling me to play the same course that everyone on the south side of the state was telling me last year. The next day I drove down to Sanford and enjoyed what I would consider my favorite public course in the United States. This surpassed my previous favorite public course of Dinosaur Mountain in Arizona, which is also a would ride. But please do not get me confused. I love traditional layouts and the history of iconic courses. But this unique design carved out of a sand/ gravel pit that Stranz produced in Sanford is a masterpiece. Do yourself a favor and purchase the yardage book at the club house. It was worth its weight in gold. Also, I was paired with two brothers that played the course once before which helped tremendously. Bring your camera and your A game, you are in for a treat. Thank you Sean for taking the time and putting together a great course review, it bought back some great recent memories and has me itching to go back soon. Final thought, I think I will put a Stranz course list together for me, in hopes that I will get the chance to play the few tracks that he got to touch before leaving us far to soon. I first read about Tobacco Road in ‘The Golf Book’ in a section titled ‘The Most Influential Golf Courses of the Past 20 Years’. The article describes Mike Stranz and his unique designs with a great picture from the tee box of Stewart Cabin on the par three 14th hole. It was immediately on my bucket list. I finally made it out there and played it in a Golf Channel tournament. Fortunately I got out there early enough to play a few practice rounds and finished T2. Nearly aced #3 (rolled past 4 inches), but put up a big numbers on 8 and 18 to doom my round. I can’t imagine playing that course in a tournament without a practice round. Nearly every tee shot and approach has a sphincter tightening element to it! I can’t recall having more fun on a golf course during a tournament. Just played it today with my 14YO son. What a course! The staff are great, the challenge is huge and every word of the angles, creativity and control on blind shots is the truth! Great review – great course!